Only a few miles from downtown Atlanta, the Michael C. Carlos Museum at Emory University should be the "X" that marks the treasure on every tourist's destination map. The Museum's permanent collection, which is what I went to see on this visit, includes thousands of artifacts from pharaoh-ruled Egypt (including the largest collection of mummies in the Southeast); robed, statuesque Greek and Roman gods; the mysterious cultures of ancient America (South America, primarily); multi-armed and golden deities of Asia; and religious and cultural masks of Africa. I can't believe this place isn't better-known…or maybe it is and just hasn't come up in conversations I've had. 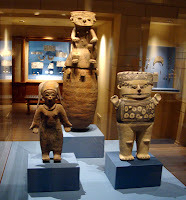 Either way, the Carlos Museum is a must-see, totally can't-miss excursion that tourists and locals absolutely must go on. 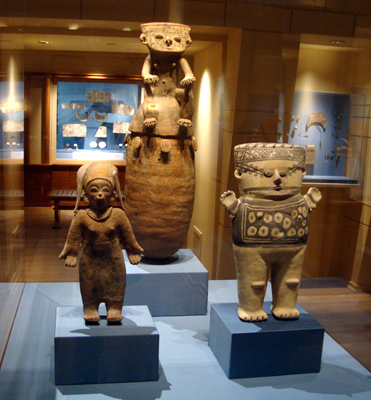 The always visitor-popular Egyptian art at the Carlos Museum is part of the Egyptian, Nubian, and Near Eastern Art gallery, featuring approximately 500 artifacts. 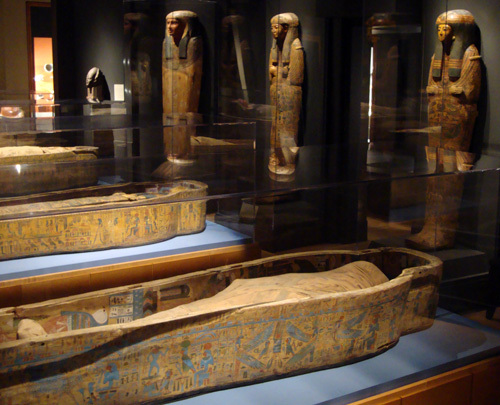 The highlight of the gallery is its mummies. 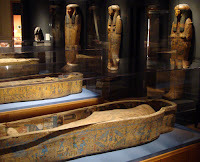 Several are laid head to toe with their coffins providing an opportunity to fully explore the remnants of Egypt's elite. Displayed in an incredibly beautiful, sophisticated fashion, they retain the mysteriousness that ancient Egypt has long held for millions around the world. 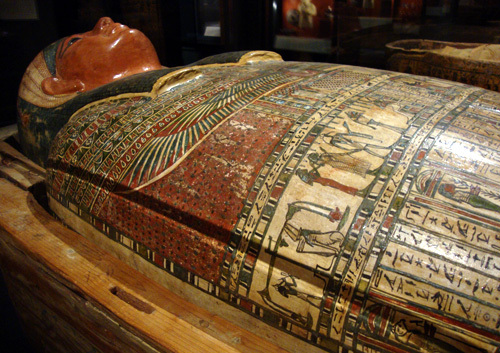 Rich in funerary artifacts, in addition to the mummies, there are coffins, statuary, jewelry and papyrus. Of particular interest, I learned why so many Egyptian statues are carved so tightly, without extended limbs. Many of the local materials used in Egyptian sculpture thousand of years ago were not terribly resilient or strong, thus many are today headless and limbless. 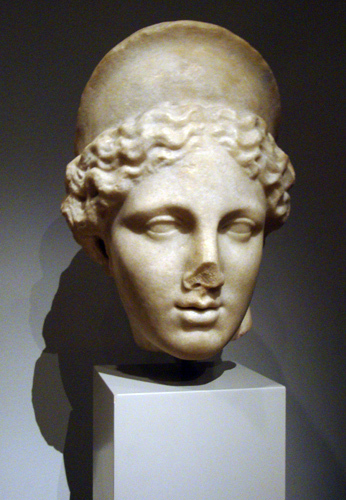 Even though I lived in Greece for more than two years and visited countless historical sites while I was there, I don’t think I'll ever tire of Ancient Greek history or Roman for that matter. 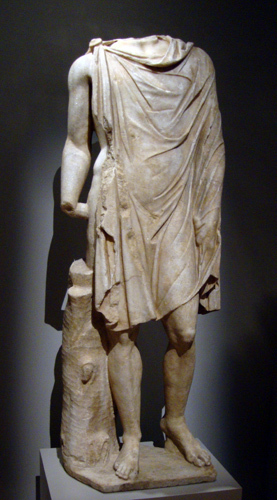 The largest artifacts in the Museum, maybe with the exception of some of the mummy coffins, are some of the statuary in the Greek and Roman Art gallery, the statue of Mercury (Hermes) and one of Aphrodite being my personal favorites. One of the really cool artifacts on display is the first known body armor to include artistic embellishments, shown in 360 degrees. 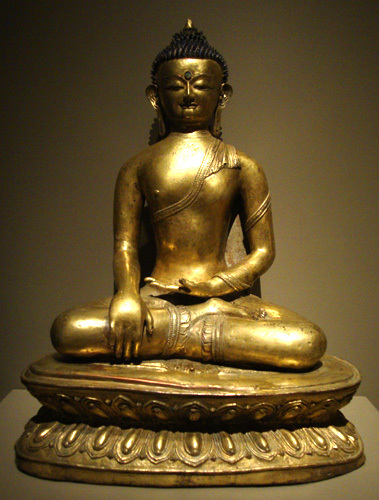 The Asian Art exhibit is comprised of nearly all religious artifacts, including some from India, China, and a golden Shakyamuni Buddha from Tibet. Although modest in size, the exhibit is indeed impressive. Some of the statues are incredibly intricate and detailed. 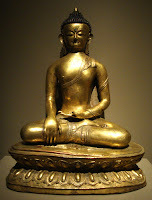 After venturing through the few rooms that house the Asia Art gallery, you feel like you've traversed through much of the far-stretching continent. 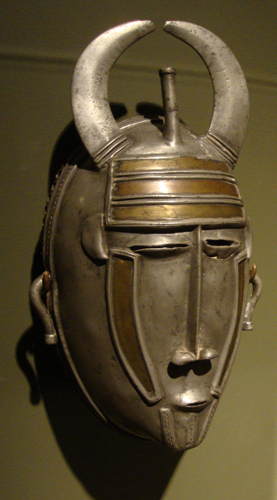 The Africa Art gallery, although more modest in size, has some incredible artifacts in its collection…especially the masks. 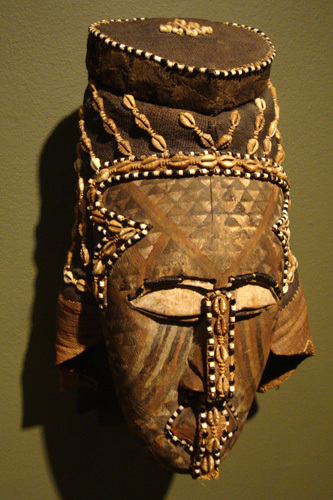 Also on exhibit are ceremonial robes, celebratory instruments, pottery, and sculpture that represent many of the cultures of Africa. 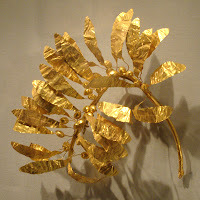 The gold work in the Africa exhibit is some of the finest I'd seen in the Museum. There also is a video playing in the gallery, as there are in other galleries in the Museum, expanding learning opportunities. The Ancient American Art gallery actually was the first one I went through, which worked out well because I finished in the Egyptian gallery. Going through the Ancient American gallery held a number of surprises...and room after room kept revealing itself. 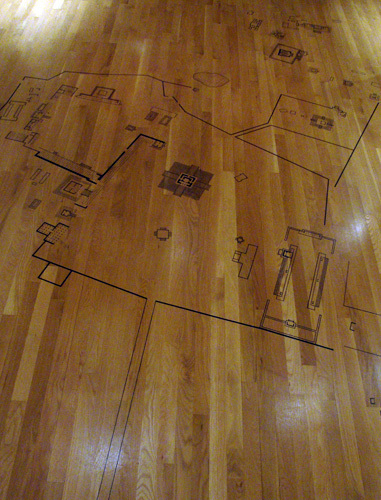 One of the rooms I walked into had black cables on the floor, so I began to watch my step…then a couple of steps later, I realized that what I thought were cables are actually ancient city plans drawn on the floor. It was the first time I'd seen the floors used in an exhibit since the Jim Lambie exhibit "Directions" at the Hirshorn Museum of Modern Art (Washington, DC)…I was impressed that the Carlos Museum used their floors so creatively. 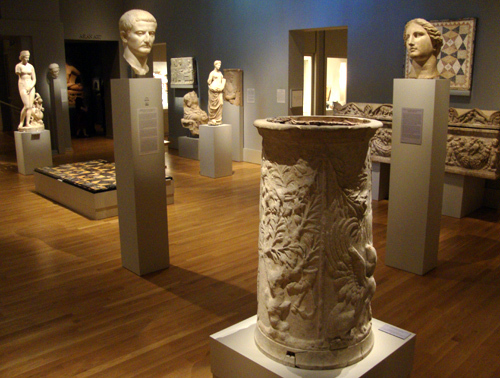 The gallery includes a lot of pottery, but also a generous dose of statuary, jewelry, and metalwork. 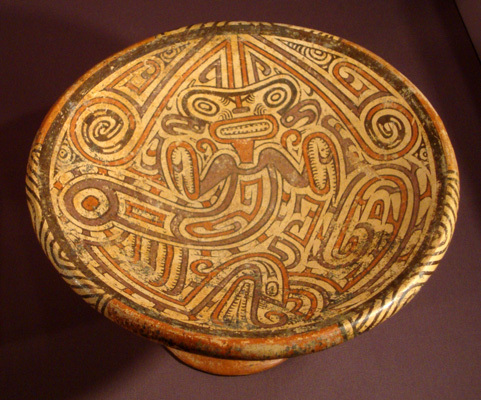 Quite a few of the pieces are rare or are in rare condition, including one dish with a painted praying mantis on it. The mantis is colored purple (rare at the time) and fully intact (rarely found not broken). On this particular visit, from all the tour options available, I opted for the self-guided tour, available to visitors during open hours. And for an additional $2, I did the audio tour. It's extremely rare that I take an audio tour, but I'm so very glad I did this one. It's extremely well done and offers a lot of bonus material including testimonials from industry experts, relative music (including performances using artifacts in the collection), and readings from ancient texts. Docent-led tours are available on Sundays at 2:30 during the academic year. Docent-led group tours are available, but require prior arrangements. A special audio tour, Times and Texts of the Bible, discusses connections between the Museum’s permanent collection and the Bible. The Bible tour costs an additional $3. "Monsters, Demons, and Winged-Beasts: Composite Creatures of the Ancient World" is the exhibit that had me sold on the Carlos Museum. Visiting this time was research, learning the lay of the land…and I'm so glad I took the extra time to see the permanent exhibit separately! Portraying a world of "myth, legend, and high adventure," the Monsters exhibit features works of art in the mediums of "gold, silver, precious and semi-precious stone, terra cotta, papyrus and more." Also coming up is "Divine Intervention: African Art & Religion" that I had a peek of being installed…looks exciting. The gist of the Divine Intervention exhibit is about the African belief that "works of art function as a bridge between the human and divine worlds." It's also timed to run during National Black History Month. 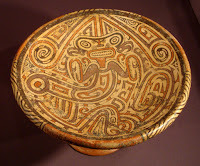 Both exhibits, Monsters, Demons, and Winged-Beasts and Divine Intervention open on February 5, 2011. Monsters runs through June 19, 2011 and Divine runs through December 4, 2011. I’d researched parking options before heading to the Museum and from the numerous options I decided on a particular route. There was road work going on, so I could not take the road I’d planned on. Instead of driving around forever, I found a Barnes & Noble on the campus and parked there. I went inside and asked for directions. The cashier helped me and one of the patrons, presumably a student, capped off the assistance with precise, succinct directions to the Museum. The morale of the story is that one should have a back-up route or at least ensure you have a map or GPS. Now when you leave, if you’re hungry or thirsty, there’s a café on the 3rd floor where you can dine in or grab something to go. They serve Starbuck’s coffee if you need a little perk-me-up. Want a unique souvenir? Stop by the gift shop…they have a little bit of everything and the prices are quite reasonable (especially compared to some other gift shops I’ve been in). In addition to an impressive permanent collection and special exhibits, the Carlos Museum hosts a number of other events. Throughout the year a visitor can choose between activities ranging between book signings and book clubs to concerts and tastings. Check the Museum’s “calendar” on their website for more information. Am I going back? I’ve been a huge fan of Ancient Egypt and Ancient Greece since I was a child, so yes, I will definitely be back…I’m especially looking forward to the Monsters, Demons, and Winged-Beasts special exhibit.